The most common type of greenhouse is a square or rectangular, self contained, free standing building with a peaked or curved roof. This type of greenhouse usually provides adequate space for planting and/or work tables on the sides and back of the structure, as shown in Figure 1. 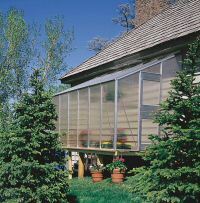 This style of greenhouse is constructed to attach to a building such as a house or garage, as shown in Figures 2a, 2b & 2c. 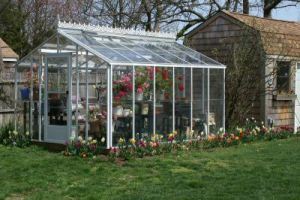 Because it is usually attached to an occupied structure providing electrical and water connections is much easier than for a free standing greenhouse. The attached greenhouse, based on usable square footage, is less expensive than a free standing structure with comparable square footage, because it has one less wall. Limited Space: If you have limited backyard space, you can still extend your growing season by utilizing a small greenhouse, as shown in Figure 3. For even smaller space requirements a three or four shelf mini-greenhouse as shown in Figure 4. 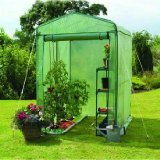 Additional information on small and mini greenhouses . Aluminum frame construction is low in maintenance and provides adequate support for various types of glazing materials including glass and plastics. However not all aluminum frames are made the same and hence vary in their ability to stand-up to inclement weather conditions. Wood frame greenhouses require on-going maintenance. Their primary advantage is that they can have a better aesthetic design and especially if attached to home can be designed to blend into the surrounding structure. There are many plans available for greenhouse constructed using PVC pipe and fittings. The PVC pipe and fittings provide the frame and the greenhouse is generally encapsulated in relatively thin, sheets of polycarbonate film. These types of greenhouses are best built to increase the growing season. However, in geographic areas with inclement winter weather, because of their light weight it is generally best to take them apart and store them during winter months. 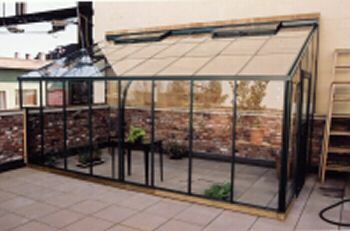 Glass glazing is by far the best alternative for a greenhouse if the homeowner is concerned about aesthetics. It provides the best in aesthetics, allowing plants to be visible from outside the greenhouse itself. Glass is superior to plastic in allowing the sunlight to enter the enclosure, especially in the winter months, see Table 1 for R-values. Polycarbonate is the most popular of the plastics used in greenhouse glazing and a 16 mm polycarbonate can reduce heating costs dramatically. However, light transmission may be reduced by as much as 12%.